Out of work and out of luck, auto mechanic Ty Lewis responds in a moment of desperation to a classified ad for a job in Harney County, Oregon. Offered the position on a remote ranch, he bids goodbye to his sister and his life in Portland. When he arrives in the tiny community of Riley to begin a new adventure, he encounters the behemoth dog that rules the ranch although he has yet to meet his boss, an elusive employer named Lex Ryan. 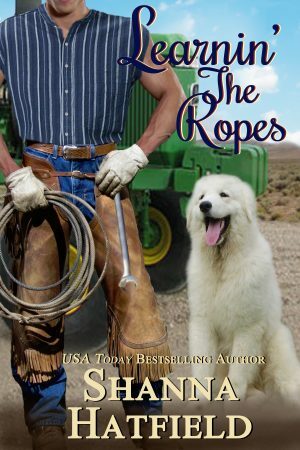 Lexi Ryan, known to her ranch hands and neighbors as Lex Jr., leaves behind a successful career in Portland to keep the Rockin’ R Ranch running smoothly after the untimely death of her father. It doesn’t take long to discover her father did many crazy things during the last few months of his life, like hiding half a million dollars that Lexi can’t find. Ty and Lexi are both in for a few surprises as he arrives at the Rockin’ R Ranch and begins learnin’ the ropes. Instead, she started twirling a strand of her hair around her finger, wishing Ty would show some interest in kissing her. All he had to do was meet her halfway. “Thank you for the wonderful meal and that amazing crisp. It was really good,” Ty said, not making any move toward leaving. “You’re welcome. Thanks for coming in and keeping me company. The house gets too quiet sometimes,” Lexi said, hoping he believed her. It was true. The big house sometimes echoed with its emptiness and made her lonely. Like now. “I’m sure Baby can keep things lively around here,” Ty said, rubbing the dog’s head again. “Baby does leave behind a well-marked trail,” Ty said with a chuckle as he thought of all the fur he’d seen earlier that morning. “Thanks again, Ty,” Lexi said, watching Ty’s eyes grow darker and his jaw set tightly. “Anytime, Lexi,” he said quietly, reaching out and taking the lock of hair she’d been twirling into his own hand. He ran his fingers along the silky strands as a sigh escaped Lexi’s rosy lips. What could one kiss hurt? He’d kiss her and neither of them would feel anything then all this awful tension between them would disappear. Ty took a step closer, dropping her hair as his hands settled on her waist, drawing her closer to him. He gave Lexi a heated look that let her know exactly what he was intending if she wanted to pull away. Anticipating her resistance, he let out the breath he was holding when she slid her hands up his arms, around his neck, and slowly lowered her lashes. He was so close, he could almost feel the softness of her lips, taste the sweetness of them. Her wonderful, warm floral scent flooded his senses as he lowered his head. When just a breath of space was all that separated his lips from hers, Baby barked and shoved her way between them, effectively killing the moment. “I guess that’s my signal to leave,” Ty said with a nervous laugh. Sending Baby a reproving glare, he opened the door and stepped outside. “Thanks again, Lexi. I appreciated the good food and company. “You’re welcome,” she whispered as Ty went down the steps and out the back gate.